playbaccaratonline.org » Baccarat Variations – What is the Best? With a long history began about 500 years ago, baccarat have made its way from luxurious game of French nobles to popular casino game known in every part of the world. This game is neither difficult nor complicated. It is elegant in its own way with the possibility to add chic into your every day routine. Mysterious and strange, baccarat game remains to be one of the most prestigious past time within online casinos. With such a long history, this game has many variations to appreciate. 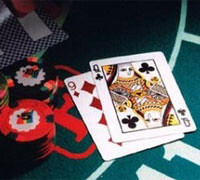 The three most popular baccarat types are Punto Banko (or North American Baccarat), Chemin de Fer and Banque. Actually, the basic rules are the same for all of them. Your main aim is to get a hand equal to 9. To be precise, you should guess whether Player or Banker gets the better hand to enjoy your win. Simple as it is. However, some difference still occur. Let’s check them to be smart in your choice what baccarat variation is the best for you. Playing this baccarat variation you can forget about any strategy at all. Why? Because, this time the casino is always the Banker with the third card dealt depends only on the value of the Players or the Dealers hands. You choose nothing. Just watch the game session… and rely on your luck only. Thus, you don’t need to memorize the values. The game is very fast and you should control your budget. Punto Banko is rather popular in North American, Australia, Macau, Finland, the UK and Sweden. Note it when travel such countries or choose this game online. This is the most popular variation of baccarat was brought to France in he 15th century. It takes its name from the iron box where the cards were kept. Now we call it “shoe”. The whole thing is that before the game starts, one player is chosen as the Banker. He deals the cards. The other players are “punters”. The good thing is that the position of the banker shifts counterclockwise. The baccarat rules are simple. If the Banker loses, the next player gets his chance to become a Banker. What is more, he also can refuse to become a Banker and other person can be chosen. If nobody wants, well, the next person in order becomes the Banker. Now the wager amount is reset. This variation of baccarat is similar to the above mentioned Chemin de Fer. The only and the main difference between them is the position of the Banker. This time the Banker remains playing his role till all the cards are dealt from the shoe. And it doesn’t matter whether he wins or not. It should be notes that when you are chosen as the Banker while playing Banque or Chemin de Fer, you just responsible to deal the cards, but not to bet on your own hand or handle payouts. There are Croupiers that do this perfect. You just enjoy the game. That’s it!